Nothing remarkable in this combination. Nothing remarkable in any of the FOUR types of pancakes I’ve baked and eaten this week. Except that these are, in themselves, remarkable. As remarkable as the last three. So remarkable that I HAD to take pictures and write about them. So remarkable that as I chew I’m already thinking of what other combinations of fruit and cake I can make for breakfast. And as I tear into another piece, I realize that this sensory satisfaction has gone over the borderline. I am a pancake junky. I will not deny it. At my best my body can tolerate most grains in unlimited quantity, so much so that I can even splurge on a wheaten food now and then and not suffer greatly. At my worst, a grain as gentle as quinoa feels like a freight train careening through my digestive tract. For years I would never dare to combine grains with fruit, because of the competing digestive enzymes (a practice I still keep as much as possible). And for much of my childhood, ingredients and awareness of tasty alternatives to gluten and dairy were just not around. So now I’m reveling in this treat that was absent in my life for so long. I know, an addict can justify anything. And I’m not so self-focused that I’m unaware of the difference between being addicted to a relatively-healthy baked good and, say, heroine (ask me about coming down off of 10-months of 24-hour constant doctor-prescribed opioids – now that wasn’t fun). So instead of groveling in guilt and thinking about having, say, eggs and spinach for breakfast tomorrow, I’m just gonna come to terms with my adoration and spell out this easy, gluten-free, dairy-free source of this moment’s joy for all you fellow junkies out there. Combine all ingredients in order listed except blueberries, mixing thoroughly with spatula. The mixture should be just slightly smooth, enough that it doesn’t run but slides a bit off the spatula. If too dry, add a few tablespoons more milk. Cook until the pancake puffs and the underside is brown, flip and cook till brown. 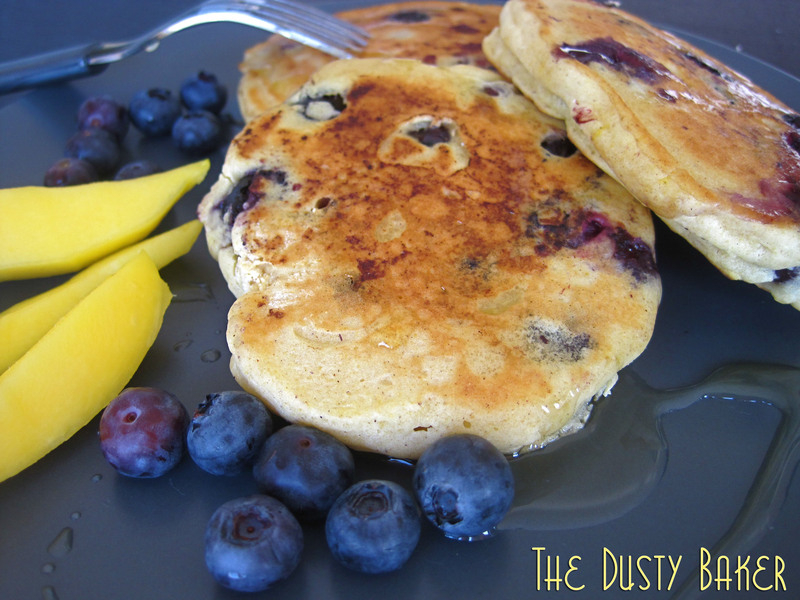 Serve with fresh blueberries and real Maple Syrup. I told you it was easy. Nothing complicated or out of the ordinary. But the lemon packs a huge punch and large, ripe blueberries provide enough sweetness that I only used a tiny bit of maple syrup. Oh. My. Dog.